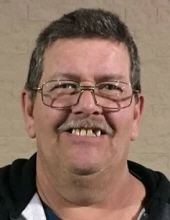 Celebrating the life of Harold Wayne Hughs Jr.
Obituary for Harold Wayne Hughs Jr.
Harold Wayne Hughs Jr., 53, Braman, OK, passed away peacefully with his family by his side on December 19th, 2017. Harold was born on May 10th, 1964 at the Claremore Indian Hospital to Kathleen and Harold Hughs Sr. He married the love of his life, Kaleen M. Hughs, June 14th, 1991. Together with the help of his first wife, Janie Selsor, they raised their 5 children. In February 1997, Harold went into Law Enforcement & became an investigator for the Osage County Sheriffs Office in Pawhuska, OK. Along his 9 year career with OCSO he made many new friends, some of which he considered brothers. He was then hired May 2007 to serve as Police chief for the Pawhuska Police Department where he enjoyed protecting the citizens and friends there. He spent 9 years living in Pawhuska with his family before moving to Braman, OK in 2011 to serve as Deputy Chief Director for the Kay County Detention Center until the day of his passing. Harold was a loving Husband, Son, Father, Grandfather, Brother, Uncle, Nephew, Cousin, and so much more. He adored spending time with his grandchildren. He loved going to see Dallas Cowboy & Oklahoma Sooner football games. He avidly enjoyed mowing, remodeling, & doing his fantasy football. He is survived by his wife of 26 years, Kaleen M. Hughs, of Braman; Mother, Kathleen Hughs, of Hominy; Brother, Otis Hughs, of Owasso; Sisters, Teresa Hughs-Waller and Anita Bellieu, of Hominy; Children, Trey Hughs and wife Lisa, of NM, Clay Hughs, of Pawhuska, Jay Hughs and wife Sarah, of Owasso, Amanda Wilson and hsuband Jeremy, of Bartlesville, Megan Hughs-Gower and husband Ryan, of Braman; Grandchildren, Hayden Hughs, Kaycee Hughs, Cash Hughs, Jaycee Hughs, Kendall Hughs, Jeremy Wilson Jr, Taylor Wilson, Autumn Wilson, Colton Wilson, Sydney Bell, Jacob Hughs, & Presaya Miller. Plus many nieces and nephews, cousins, etc. He is preceded in death by his father, Harold Hughs Sr.; Grandchildren, Cayden Hughs and Miayah Hughs; Along with many other great friends and family. His viewing will be December 21st 2017 from 9am-8pm at the Trout Funeral Home in Blackwell OK. His services will be at 9-10am, Friday, December 22nd, 2017. Directly following the services, family will proceed to the graveside to lay him at rest. Graveside will be reserved for family only and a private dinner to follow. If you would like to make an online condolence, please go to www.troutblackwell.com. To send flowers or a remembrance gift to the family of Harold Wayne Hughs Jr., please visit our Tribute Store. "Email Address" would like to share the life celebration of Harold Wayne Hughs Jr.. Click on the "link" to go to share a favorite memory or leave a condolence message for the family.